"I've not got a great deal to say about it, but then again I might have, who knows?” chuckles Andrew Weatherall down the phone, quite wrongly, in his slightly whiny Windsor accent. We’re talking about food. Having been “unceremoniously” kicked out of the family home aged 18, young Weatherall soon realised it was cheaper to buy meat and veg than it was to always eat takeaways. Out of necessity, he taught himself to cook, but is still "a big fan of the Colonel." “I don't have a signature dish. Nothing spectacular. Not duck in a reduction of its own tears,” he says, coughing on his first spliff of the day. “But I do a very, very good prawn and crab linguine, and my roast spud work is up there with some of the best.” After saying he also dines out at some of London’s finer establishments a couple of times a month, he agrees he likes his food like he likes his art—both high and low—then proves it by detailing the KFC gravy test. For many people, Weatherall himself is quintessentially British. His dress is a mix of Edwardian outlaw and stand-up gent in tailor-made tweed suits (though American workwear and heavyweight Japanese denim also feature in his wardrobe.) His music also brings the two great British traditions of rock music and acid house closer together than anyone else has managed. On top of that, his often evocative track titles and lyrical references are quaintly poetic while effortlessly evoking English literary greats like John Betjeman. 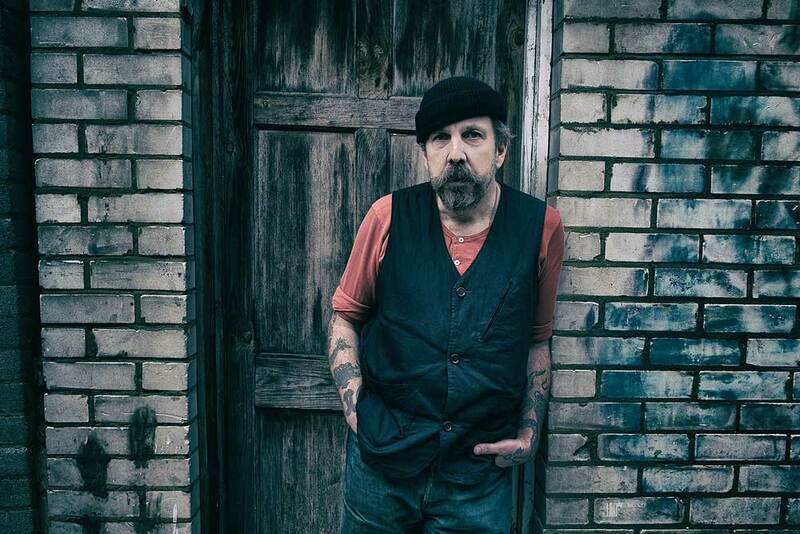 In conversation, Weatherall is a colourful raconteur. He has a quick knack for recall that means he can quote Voltaire one minute then flip into a story about snorting coke with Primal Scream’s Bobby Gillespie the next. He rarely pauses for thought, but his sentences are as eloquent as anything most people could write with hours of contemplation. As well read as he is (“I’m not religious so I go to great literature and history books to find stories that help me make sense of human existence,”) he’s also keen to joke, happy to call ten-a-penny festival promoters “cunts” and discuss using mushy peas as "chip lubricants." If you see him on a bus in Dalston, as did a friend recently, he’ll happily engage. One thing he happily discusses redressing is his drug use. He’s spoken before about being on top of a hill, overlooking London, tripping on acid and thinking he was controlling the thunder above him with the staff in his hand. But no more. He isn't an “I’ve given up merchant,” because they can be “self-righteous,” and it forces people to sneak off to do drugs in the toilet, which makes the act “transgressive” and therefore appealing once more. He just says no thanks. “There was a turning point where I had to make a decision about ten years ago and it’s like, ‘do you enjoy snorting cocaine, or do you enjoy making art more?’” He decided the feeling he gets from making art is “better than any drug known to mankind.” The thrill of a successful live show or DJ gig he also says is a mix of relief, celebration and transcendence, as well as a rather heavy psychic burden. As sure as you can be of anything in 2017, you can be sure that Weatherall will never sell out. Even after producing the era-defining, first ever Mercury Prize winning album Screamadelica by Primal Scream in 1991, he rejected the many offers of remix work because the bands asking weren't the sorts to hang out in clubs, so why would they want/should they get a rave remix. 26 years after the release of that album, Weatherall is as uncompromising as ever and remains resolutely in the shadows. Musically, he is still “ploughing the same furrow as ever,” not least on his latest solo long player, Qualia. It has the same underlying sense of groove, rhythm, chord progression and structure that all his work does, from Two Lone Swordsman to The Asphodells. The only thing that's changed, he reckons, is the gear available to him in the studio. The album is a chugging affair that never tops “the dizzy heights of 120bpm” and is coated in cosmic effects and filthy, low-slung guitar licks. It was informed by him reading Nobel Prize winning French author Patrick Modrian. He’s a writer with a largely homogenised body of work that came into the wider English consciousness after that prize in 2014, and is about finding oneself and one's identity by looking backwards. In the last two years, he has produced 60 new tracks. Some made the album, others have gone “elsewhere,” including one remix for Liam Gallagher that is “Larry Heard-esque.” These are the latest additions to a discography that already has nearly 1000 credits and reaches back to 1989. He puts his on-going drive down to DJ gigs which often mean he can't wait to get to the studio on Monday. But also the “gnostic experience” and “connection to the divine” that is visiting art galleries and seeing the texture of paint on canvas, as well as reading, and how it “opens up certain imaginational pathways” in his brain. Andrew Weatherall returns to The Warehouse Project as part of The Chemical Brothers' headline show, alongside Sean Johnston. SOLD OUT.